Hundreds from Ridgewood, N.J., turned out to attend the funeral of a 10-year-old boy who died from a rare form of bone cancer – in his short life, he made a huge impact on the community. NBC's Katy Tur reports. Michael Feeney died last week after a four-year struggle with a rare and aggressive form of bone cancer. In the New Jersey village of Ridgewood, Michael Feeney was a celebrity. He swapped campaign advice with the mayor. For a short time, he served as police chief. This Friday, he was to light the big Christmas tree downtown. Michael Feeney died last week after a four-year struggle with a rare and aggressive form of bone cancer. On Tuesday, the village honored him with a funeral with full police honors. 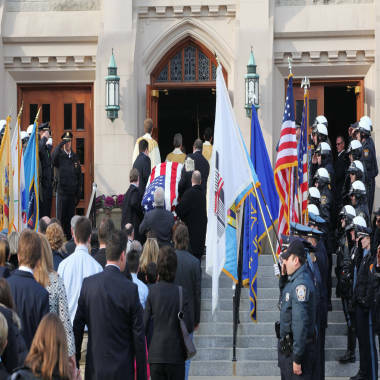 At least 24 police departments were represented at the funeral. A bugle corps from the Bergen and New Jersey Transit police sounded a faint drumbeat to lead the procession into the church — friends, family and the casket, draped with an American flag. Eighty officers flanked the entrance and stood at salute. 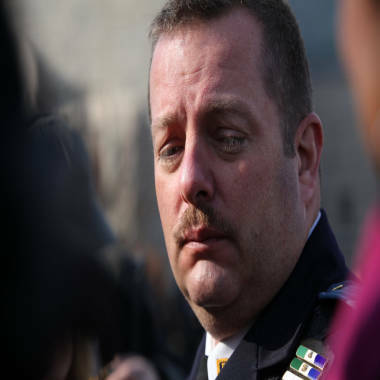 “I lost a partner today,” the Ridgewood police chief, John Ward, told reporters. Michael, who was in fifth grade at Hawes Elementary School, had a short life that was plagued with health problems, but they never managed to surmount what people close to him described as a relentless spirit. His mother, Jill Feeney, contracted a virus while she was pregnant that left the child with a 15 percent chance of survival, The Bergen Record newspaper reported. At age 6, after persistent shoulder pain, he was diagnosed with the cancer, Ewing’s sarcoma. Michael had shoulder replacement surgery, radiation and, recently, brutal chemotherapy treatments. But you would never know there was anything troubling him, the mayor recalled. His father, Jack Feeney, told the newspaper that the boy made it to MetLife Stadium in October, “screaming, dancing, cheering” as his beloved New York Giants beat the Minnesota Vikings. 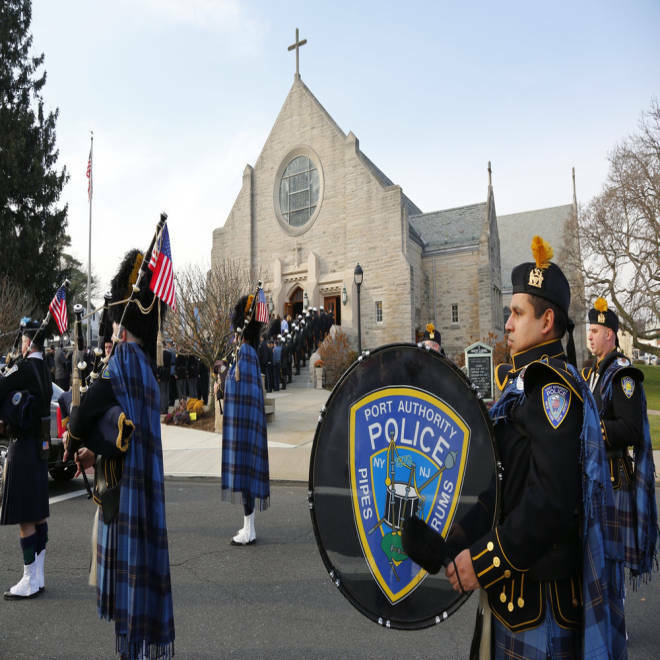 The village of Ridgewood, N.J., honored 10-year-old Michael Feeney at a funeral with full police honors. “He just had this smile and brightened up the entire room and made everybody feel so warm and good,” said a friend, Hailey Franco, also 10. The mayor said that Michael came to him for advice in September, when he was running for president of the student council. He wanted help with his stump speech. The mayor said he had little to add. 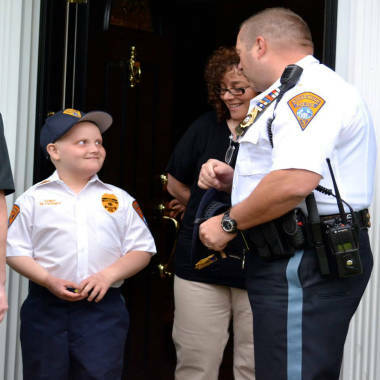 In June, the mayor swore in Michael as honorary police chief for a day. Facebook photos from the ceremony show the child signing papers to make it official, trying out the chief’s big chair, and inspecting a village jail cell — with his sister, Cassandra, inside. He released her to take a math test. "I think we need to learn from young people like this," Ward said. "You know they're not jaded by our world yet and they still see the goodness in everybody, and Michael brought out the best in everybody." Two weeks ago, when the family was on vacation at Walt Disney World, the village wanted to make sure Michael celebrated one more Christmas. So hundreds of people strung lights and ornaments on the Feeneys’ house and put a Santa Claus and sleigh on the roof, The Record reported. Police officers from at least 24 departments across N.J. attend the funeral of 10-year-old Michael Feeney who was made an honorary officer before he lost his battle with cancer. In Ridgewood, a village of about 25,000 people just across the Hudson River from New York City, Michael was to light the tree at a downtown celebration on Friday night, right alongside the Ridgewood High School marching band. Thousands are still expected to gather on East Ridgewood Avenue for the celebration on Friday night. But on Tuesday, the village came together for a Mass at Our Lady of Mount Carmel Church to remember Michael. That included the police, to remember the youngest fallen member of the force.